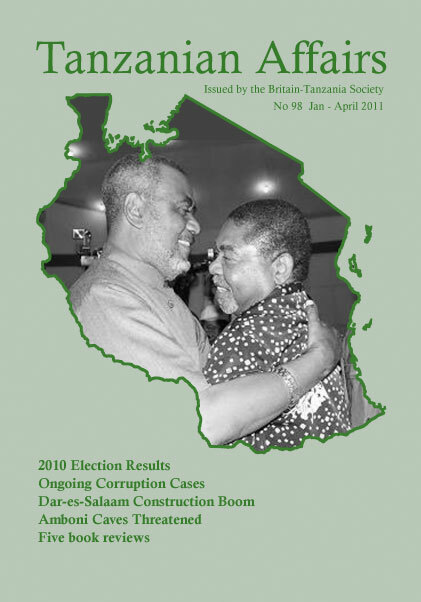 In Tanzania’s elections on 31 October 2010, for the first time since independence, an opposition party made significant gains in votes and seats in Tanzania’s National Assembly. The ruling CCM party’s presidential candidate Jakaya Kikwete saw his vote drop to 61% compared with 80% in 2005. Leading opposition CHADEMA presidential candidate Dr Wilbroad Slaa got 26% and the presidential candidate for the Civic United Front (CUF) (whose main strength is in Zanzibar) Professor Ibrahim Lipumba was in the third position with 8% of the vote. 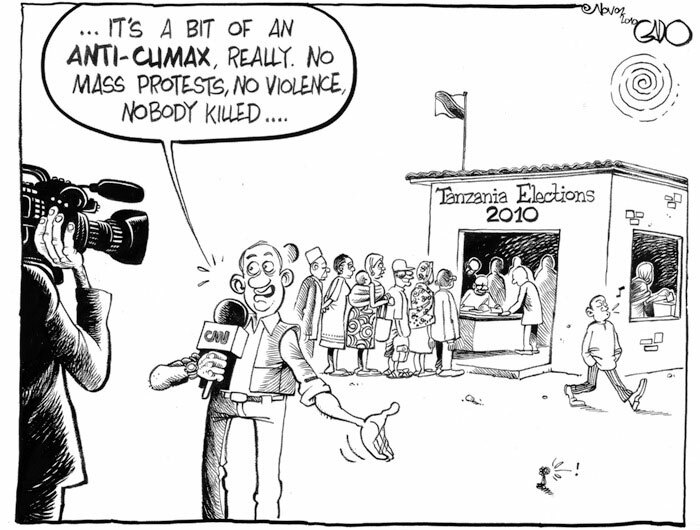 The ruling CCM party lost 55 seats in parliament while the CHADEMA party increased its seats from 5 to 24. 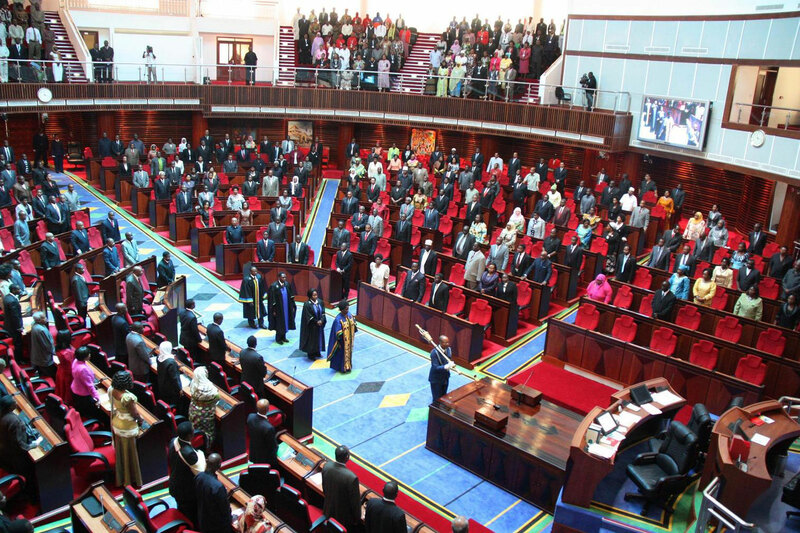 Thus, Tanzania now has a viable opposition party in parliament and observers are anticipating lively debates. Tanzania was showered with praise on its conduct of the elections from the large contingent of foreign observers in the country and by heads of state and leaders of international organisations. 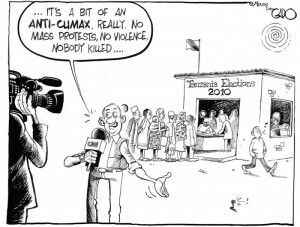 The elections passed largely peacefully although there were many minor incidents in individual constituencies before the elections when CCM was involved in often passionate debates on the selection of its parliamentary candidates and during the counting of the votes when there were complaints about the delay in publishing some results. CHADEMA, while accepting the validity of the parliamentary elections, and after an apparently heated internal debate on what to do, refused to recognise the re-elected President Kikwete because it believed that the published results of the presidential election had not been correct. The Party’s MP’s then walked out when the President began his inaugural speech to the new parliament. CHADEMA leader Freeman Mbowe said that their aim was to pressurise the government into changing the constitution so that future elections would be free and fair. He said that his party was not satisfied with the way the presidential votes had been counted and the results announced. He pointed out that the law and did not allow anyone to question the presidential election results yet it was possible to question the outcome of parliamentary and civic polls. The law had been drawn up during the period of the one-party state and was now obsolete. CHADEMA would press for the formation of an independent commission to examine the presidential poll results and to make proposals on the preparation of a new constitution. Asked if CHADEMA’s readiness to meet the government was not against their stand not to recognise President Kikwete, Mbowe explained that they acknowledged the presence of the head of state though they were not in agreement with the way he was elected. The Citizen quoted Prime Minister Pindo as saying that CHADEMA MP’s had shown weaknesses in handling issues and its MPs had proved to be still very young democratically. Mr Pinda said he had been ready to meet with CHADEMA and discuss their problems but they had decided to take another measure which was not helpful in building the country’s democracy and bringing development. 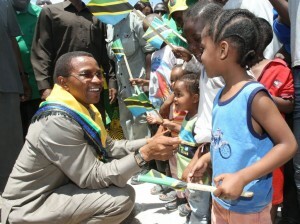 President Kikwete told parliament that there was no way for any person to avoid CCM’s government. “People will come and go but this is the CCM government and it will remain in power whether they like it or not. I am the President and they will end up bringing their problems to me,” he said. In the following weeks the demands for a new constitution grew amongst wide sections of the population. President Kikwete garnered 5.2 million votes or 61% of the 8,626,283 ballots cast, followed by CHADEMA’s Dr Willbroad Slaa, with 2.2 million votes or 26%. The new Vice President is the prominent Zanzibar leader Dr Gharib Billal, who was not voted for being part of President Kikwete’s ticket. After seven by-elections were held in seats where there had not been enough ballot papers, the final result of the parliamentary elections for the 239 elected seats in the Union National Assembly (when special nominated seats for groups such as women and youth are added the total is 358 MP’s) was as follows: CCM 188. CHADEMA 24, CUF 21, NCCR-Mageuzi 4, United Democratic Party (UPDP) 1 and Tanzania Labour Party (TLP) 1. By comparison the 2005 results were as follows: Kikwete 80% and out of 232 elected seats: CCM 206, CUF 22, CHADEMA 5, TLP 5, UDP 2 . Five seats were vacant at the time. The number of MPs increases to more than 350 compared with 323 following the demarcation of new constituencies. The President also appointed additional MP’s representing special interests such as women and youth. After these appointments the number of opposition MP’s in the National Assembly was as follows: CHADEMA 45, CUF 34, NCCR 4, TLP 1 and UPDP 1 – Guardian. In Zanzibar President Shein appointed a number of Special Seat MP’s making the composition of the House of Representatives CCM 28 and CUF 22. There were differences in regional voting patterns. CCM remained very strong in all the coastal regions and strong in most other areas. CHADEMA gained votes and seats in urban centres and, in particular in the Kilimanjaro, Arusha, Mbeya and Kigoma regions. Opposition parties in Klimanjaro Region won four seats – three CHADEMA and one TLP. In Lindi the CCM candidate made some derogatory remarks about the CUF candidate. He advised voters that his opponent ‘suffered from albinism’ and should be avoided by voters who should … keep their distance from him because albinism was a curse. But the Albino is the new MP for Lindi. The result in the constituency of former Prime Minister Edward Lowassa, who had been alleged to be involved in corruption, caused surprise in some circles. His electorate showed that they had not lost confidence in him by giving him an overwhelming majority. Former prominent minister and MP Augustine Mrema is back in the forefront of Tanzanian politics after his success in the elections in Moshi. He himself became MP for Vunjo and his TLP party did well in the civic elections. Former Speaker of the National Assembly Samwel Sitta said that in his new position as Minister for East African Cooperation, he would continue advocating ethical and transparent leadership as he had done when he was Speaker. During his heyday he had given government leaders a tough time by allowing fiery debates that led to the resignation of the then Prime Minister Edward Lowassa – Mwananchi. The new Speaker is Anne Makinda, Njombe South MP (CCM), the first woman in the country’s history to be elected to this post. She brings a wealth of experience having been an MP for 35 years, and having been the deputy Speaker for five years. CHADEMA won its first seat in Manyara region when its candidate Mustapha Akunaay, the outspoken executive secretary of the Tanzania Association of Tour Operators, defeated veteran CCM Minister Phillip Marmo by a margin of over 20,000 votes. In the Arusha council elections a CHADEMA Rastafarian was elected: The Citizen wrote: ‘Donning his characteristic curled hair and a green-and- yellow cap associated with the culture, astounded some of his political rivals. During the campaign he was perceived by his rivals as a marijuana smoker unfit for leadership because of his behaviour which ‘resembled that of some famous Rastafarians in the Caribbean.’ However he insisted that he had ‘never ever’ smoked bhang or any other narcotic drug and did not plan to do so. CHADEMA had advised him to remove his Rastafarian attire “But I told them that I had better leave politics than remove my Rasta fashion. Since then nobody has ever discussed this matter with me again “ he said. Another of the new MPs is rapper and Bongo Flava artist Sugu (Joseph Mbilinyi) who won the Mbeya Mjini seat for CHADEMA. He defeated the incumbent CCM candidate Benson Mpesya by 46,411 votes as against 24,236. Sugu’s campaign had the theme “Tumaini Jipya kwa Maendeleo ya Wote” “New Hope for Development for All”. In an interview Sugu said “It pains seeing many musicians in the country failing to pay for a bus fare, while someone somewhere is eating the sweat of musicians.” Fellow musician Afande Sele says that he hopes Sugu will be able to reduce the problems Tanzanian musicians face due to widespread piracy of their work. 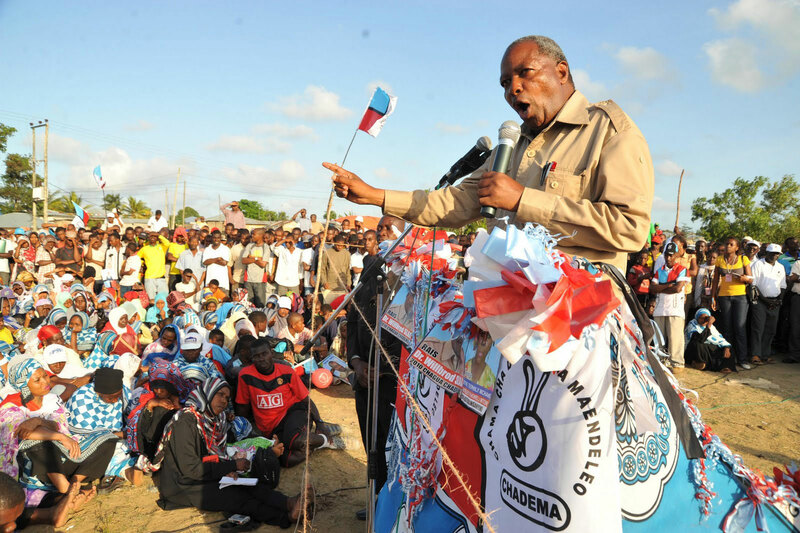 The CHADEMA presidential candidate Dr Wilbroad Slaa attracted massive crowds during the election campaign wherever he appeared. As an example, on September 19, the Guardian reported that business in Arusha came to a standstill for four hours as thousands of its residents rushed to welcome him. His decision to vie for the presidency ‘had changed the political wind in the country.’ A convoy of hundreds of vehicles accompanied the candidate to the rally grounds. Security officers were almost overwhelmed….Finally came the moment when Dr Slaa stood to address the crowd. “We have not ferried you from your homes to this place with lorries or buses…Neither did we give you free T-shirts nor khangas plus money to solicit you to come here….Your massive attendance is a demonstration that you are fully committed to change” he said. Slaa said it was a shame that people from a nation endowed with abundant natural resources such as minerals and wildlife led a miserable life while countries with minimal or no resources such as Kenya were now offering education for free. He said Tanzanians, for a long time, had been victims of poor government policies, corruption and embezzlement of public funds. He added that CHADEMA would raise money to finance education and heath care services by cutting down public spending through reducing the size of the cabinet to not more than 20 seats, slashing MPs’ emoluments, abolishing some government posts, such as the post of district commissioner, and reducing procurement of government vehicles. He said other money would be generated after overhauling mining contracts. Slaa maintained that a CHADEMA government would waive all taxes on construction materials to enable people to construct decent houses. Needless to say, with its vast financial resources the CCM also put on a well organised campaign and President Kikwete’s numerous rallies attracted huge audiences many draped in the party colours. Undeterred by the unprecedented walk out by CHADEMA MPs, the President continued with his inaugural speech to Parliament and emphasised the need to build a middle-class economy and empower small-scale and medium entrepreneurs, farmers, pastoralists and fishermen. He outlined 13 priority areas, which his administration would concentrate on in the next five years. He called for speedy healing of rifts created in the run-up to and during the elections to forge national unity. He said the government would continue to equip the Tanzania People’s Defence Forces (TPDF) and the Police Force to safeguard the country’s borders, and protect the people and their properties. He said he had noted religious incitement during the campaigns, which had fuelled rifts that could jeopardise national unity. “The elections are over. We must now concentrate on building our country,” he said, stressing his willingness to work with fellow politicians and religious leaders to end the rifts. The government would also attract investment in new industries and revive the defunct ones. Efforts would also be made to ensure reliable power supply and infrastructure for factories. “We will establish and strengthen the Tanzania Investment Bank to lend to entrepreneurs. We will also strengthen SIDO to serve more Tanzanians,” he said. In the past five years, he said, the country had reviewed contracts with major mining firms, some of which had started to pay taxes. A new mining policy as well as legislation had been enacted to boost local participation in the sector. More than $4.7 billion was earned from minerals. The government would now acquire shares in major mining firms. He said there were plans to establish and attract agro-processing industries as well as local processing of minerals such as gold and tanzanite. On railways, President Kikwete conceded that the government did not handle the area well in the past five years, but said that had been a good lesson to the government. “Our efforts to improve railways failed. But we are determined that in the next five years, we will take the correct steps because we have learnt our lessons,” Tazara and the Central Line would be rehabilitated to standard gauge level from Dar es Salaam to Mwanza and Kigoma and a new railway from Isaka to Kigali, Rwanda and Bujumbura, Burundi built. The construction of Dodoma University would be completed to pave the way for work on the Mwalimu Nyerere University in Butiama and the Muhimbili University of Health and Allied Sciences. The Mbeya Institute of Technology would be upgraded to a full university. The government, he added, would continue to reduce dependence on hydropower generation. He said emphasis would be put on power production from natural gas, coal, wind and solar power. Many observers were surprised when it was revealed that, of the 20,137,303 registered voters, only 8,626,283 or 42% voted, making it the lowest turnout since the restoration of multi-party democracy in 1992. In 2005, when Mr Kikwete was first elected President, the turnout was 72% of the 9.1 million voters. In the 1995 and 2000 General Elections, 76% and 84% of the registered voters cast their ballots, respectively. In the 2010 election 2.64% of votes were spoilt. • Public funding was biased in favour of the ruling party which also had access to government transport, security, buildings, and helicopters. According to the East African, government financial support for the election campaigns of the different parties (based on the results of the previous election) was as follows: CCM $1.5 million, CHADEMA $500,000, CUF $100,000. Finance – Mustafa Mkulo (no change). Water – Prof Mark Mwandosya (Irrigation has been moved to the Ministry of Agriculture). Youth Affairs has been moved from Labour to the Information & Sports ministry. 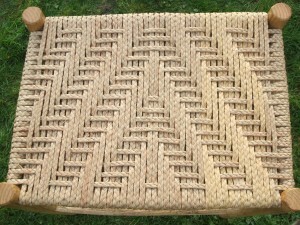 This led to an increase of the three positions. The President said the additional positions were needed to have ministers of state overseeing Coordination as well as Planning. Under the Prime Minister’s Office, a new position focusing on investment promotion and economic empowerment has been created. The President appointed two ministers of state under his office – Mathias Chikawe for Good Governance and Stephen Wassira for Relationships & Co-ordination. Ms Hawa Ghasia retained her previous position as Minister of State, Public Service Management. There are ministers of state for Union Affairs and the Environment in the Vice President’s Office. 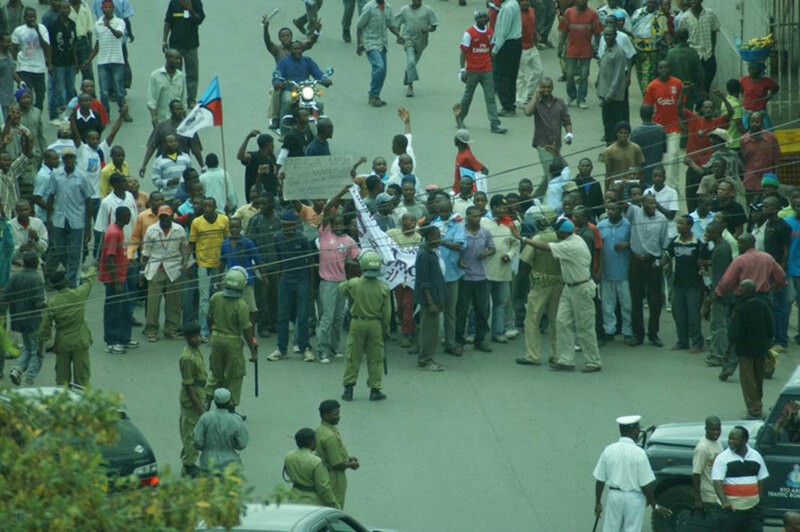 As this issue goes to the press, there are reports that three people were killed by police during a demonstration organised by CHADEMA in central Arusha on Jan 5th. The CHADEMA leadership were arrested and held overnight before being released on bail. We will include more details in the next issue of Tanzanian Affairs. 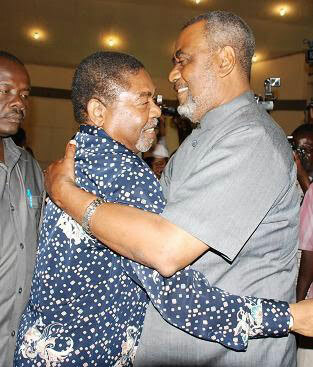 New President of Zanzibar Dr Ali Mohamed Shein (CCM) (left) and First Vice President, Maalim Seif Shariff Hamad (CUF), embrace at the start of the Government of National Unity. The former Vice-President of Tanzania, Dr Ali Mohamed Shein who hails from Pemba, won the Zanzibar presidential election in Zanzibar with 50.1% of the votes. 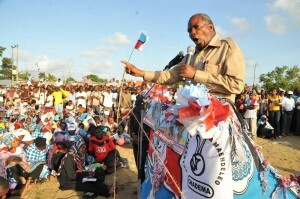 The CUF candidate Seif Shariff Hamad gained 49.1% of the votes. There were four other candidates. As a result of the agreement entered into before the elections under which there would be a Government of National Unity (GNU) in the Isles after the election, the election itself took place peacefully and without major problems unlike the elections during the previous 15 years. Some analysts have been trying to explain how it was that the two main parties (CCM and CUF) were able to come to an agreement after their fierce rivalry in the past. The explanation they have given is that CUF finally realised that the CCM would never allow it to rule Zanzibar alone (several CCM leaders made this clear in the past) and, that, if it were to have influence in the development of the country it could only do so in a government of national unity. Similarly, the explanation continued, the CCM realised that it was losing support and risked losing the 2010 election if this was free and fair. The election results, with the difference between the respective party’s votes differing by only one per cent, tend to support this hypothesis. The new President Dr Ali Mohamed Shein increased the number of ministers in his cabinet from 13 under the previous President Karume to 19 plus six deputy ministers (compared with five). The Special Seats for women were increased, with eleven allocated to CCM and nine to CUF. Veteran leader in the Isles of the CUF party and a former Chief Minister in a CCM government, Zanzibar`s new First Vice President, Maalim Seif Shariff Hamad, has revealed that his official duties in the GNU will include being first-line advisor to the President and overseeing issues relating to the environment, people with disabilities and the war on drug abuse and HIV/Aids. Maalim Seif also explained that Zanzibar’s seventh phase government was determined to serve the people as diligently and efficiently as humanly possible and that the most important thing was for people to give their all in helping the government to serve them. He wanted to cut red-tape in the public service to the minimum and said he would himself set a good example by reporting for duty at 7.30am each day. He said that Zanzibar would only move forward socially, economically and otherwise “if all people ensure maximum discipline at their various workplaces and if public servants desist from bureaucratic behaviour and practices”. He hailed the new President, Dr Ali Mohamed Shein (who had been Vice-President of Tanzania prior to the elections), for having cooperated with him during the run-up to the formation of the GNU and the cabinet “despite the fact that the constitution allows the president to form the cabinet even without any consultations” – Guardian. The Second Vice President, Ambassador Seif Ali Idd, will be responsible for government business. One day after President Shein declared his new cabinet the group of 12 elders from Pemba who have been calling for secession of the island from Zanzibar said their demands had been met. 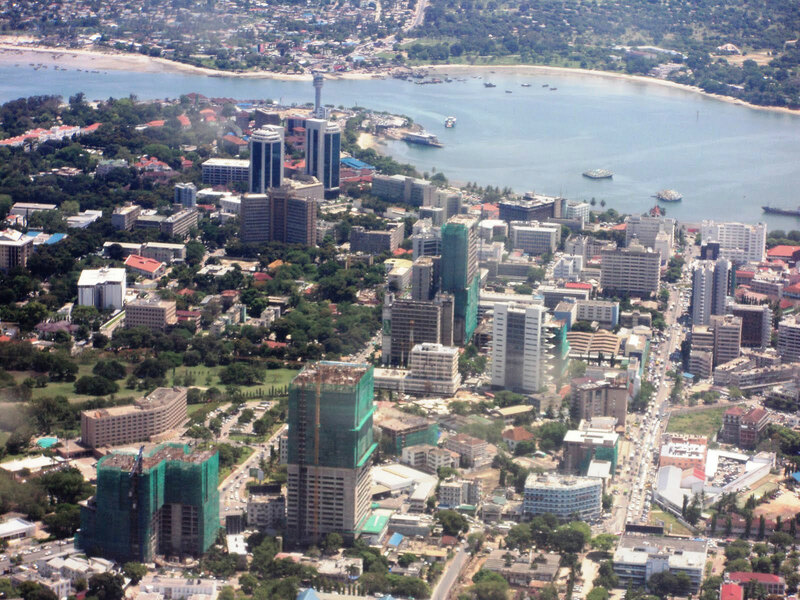 Four years ago they submitted a petition to the UN and foreign diplomatic missions in Dar es Salaam, complaining that people of Pemba were denied their basic rights by the governments of Zanzibar and Tanzania. Coordinator of the group, Ali Makame said Zanzibar can now teach democracy to other African countries. He said the Pemba elders were now willing to collaborate with the unity government – Mwananchi. The case related to the purchase by Tanzania of an air traffic control system (RADAR) from Britain’s BAE Systems in 2001 for £28million reached apparent finality in London in December. After an unexpected reversal by the High Court in London of a previously agreed plea bargain arrangement under which BAE would compensate Tanzania, new information came from the publication by the London Guardian of dispatches from the American Ambassador in Dar es Salaam revealed by WikiLeaks. In its comments the Guardian wrote: ‘Every individual involved in the BAE scandal in Britain and Tanzania has escaped prosecution. BAE had agreed with the UK Serious Fraud Office (SFO) to pay £30m in corporate reparations and fines, provided the word “corruption” did not appear on the indictment. The Head of Tanzania’s Anti Corruption Bureau had alleged that his life might be in danger on this matter and that senior politicians in his country were ‘untouchable’…. In what appeared to be the end of the matter, as far as Britain is concerned, the Southwark Crown Court in London ruled that BAE would pay a fine of £500,000 for ‘failing to keep proper accounting records,’ £225,000 in legal costs and the remainder of the penalty of £30 million to the people of Tanzania as restitution. The court criticised BAE for concealing the purpose of nearly £8 million in payments made to Shailesh Vithlani, its marketing advisor in Tanzania at the time. (Thank you Elsbeth Court and John Sankey for helping on this story – Editor). On November 15 the International Chamber of Commerce (ICC) ordered the Tanzania Electricity Supply Company (Tanesco) to pay Dowans Holdings SA and Dowans Tanzania Limited a sum of Shs106 billion for breach of a power contract. The two companies inherited the project from the controversial Richmond Development Company of the USA’s Shs152 million-a-day emergence power supply contract, which was also the cause of the resignation of three ministers including the Prime Minister in February 2008. The two parties in the case were also instructed to pay fees and expenses of the arbitrators and the ICC administrative expenses amounting to $750,000 equally. Tanesco had moved to the High Court to restrain Dowans from disposing of its turbines. Dowans wanted to sell the turbines after the government had terminated power production and purchase agreements between Tanesco and Dowans on grounds of underperformance. The plan to sell the turbines had been a source of public debate throughout 2010 with some people proposing that the government should nationalise the plants after the company had allegedly failed to honour its agreement. There were varying reactions in Tanzania on whether the country should pay such a large sum to Dowans. Several leaders said that Tanzania should not pay. Before this court decision the Government had increased the supply of heavy fuel to Dowan’s firm – Independent Power Tanzania Ltd (IPTL) – enabling it to pump more electricity into the national grid to ease the ongoing power rationing – Majira. In September the Bank of Tanzania’s former Director Amatus Liyumba was sentenced by the Kisutu Resident Magistrate’s Court to two years in jail after he was found guilty of abuse of office during the construction of the Bank of Tanzania’s ‘Twin Towers’ project. His lawyers immediately filed an appeal. The change of scope of the work being done had been under the supervision of the Bank’s former Governor the late Dr Daudi Balali, who was in charge, they claimed. They further submitted that the court erred when it dismissed the appellant’s defence and his witness, former BoT secretary Bosco Kimela, on grounds that they had cooked their testimony because they were locked in the same remand prison – Guardian. 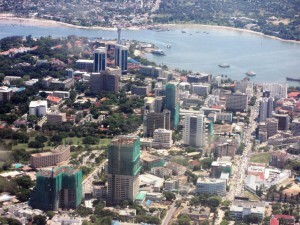 Visitors to Dar-es-Salaam cannot fail to see evidence of the construction boom in the city. Perhaps most obvious is the number of skyscrapers being constructed in the central Kivukoni area (see photograph). One casualty is the Nyumba ya Sanaa (Nyerere Cultural Centre) which has been demolished to make way for a tower. The centre’s operations will be relocated to Msasani Village. 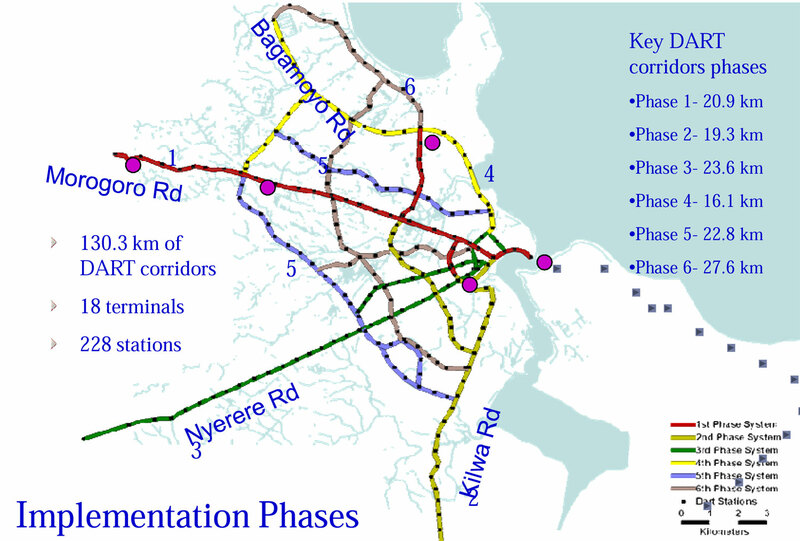 An ambitious project to try and alleviate the chronic congenstion faced by commuters is the Dar es Salaam Rapid Transit (DART) project, which was launched by President Kikwete in September and is expected to start operating in 2012. The system will use guided buses (Bus Rapid Transit) on segregated bus lanes, and dala-dalas will no longer be allowed to operate on the routes, but will operate as feeder services to the DART arterial routes. The project will comprise six phases and a total of 130km of road plus two workshops, five main stations and six feeder stations. The first phase has just been let to Chinese firm Beijing International Engineering Group (BCEG). The route follows Morogoro Road from Kimara – Ubungo – Kivukoni with branches to Kariakoo and Morocco. 145 articulated buses, each capable of carrying 140 passengers will operate on the route, with an expected 400,000 passengers using the system every day. 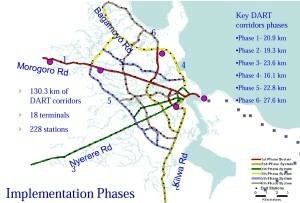 Subsequent phases comprise Kilwa Road, Nyerere Road, Bagamoyo Road, and orbital routes. The scheme further includes cycle tracks alongside the routes with the aim of encouraging non-motorised transport in the city. Funding for the project comes from the World Bank and UNEP as well as the Tanzanian governemnt. The government has also released a tender for construction of a road flyover at Tazara and a bridge at Bendera Tatu that will link the junction of Nyerere Road to Bibi Titi Road, also with the aim of reducing congestion. Private development is gradually spreading outwards from the central areas of the city, for example a large mixed use project planned for Mchikichini, Illala district, with over 1,600 multi storey flats, office accommodation and hotels, jointly funded with a Malaysian company. Construction work is also underway at Julius Nyerere International Airport (JNIA). Speaking at the official launch of the project, Tanzania Airports Authority (TAA) Director General, Mr Prosper Tesha said that the project would involve rehabilitation of taxiways, runways and sewage system, and is set to be finished by May 2011. The Tanzania Zambia Railway Authority (Tazara) has signed a contract with a Chinese manufacturer for the manufacture and supply of 90 container wagons worth approximately US$5 million. The Chinese company was given eight months in which to manufacture and deliver the wagons which will be used in the transportation of containerised cargo and metals such as copper and manganese. Other components of the agreement are expected to follow including the supply of six new mainline locomotives, rehabilitation of three shunting locomotives and training of staff. Chinese ambassador to Zambia Li Qiangmin was quoted as saying that Tazara was a symbol of friendship between Zambia and China and his country was saddened by problems the company was facing. “We are sending a technical team to Tazara to investigate the problems and help them improve efficiency,” the envoy said. Tanzania’s Infrastructure Development Minister Shukuru Kawambwa was quoted as saying that the Chinese financing was intended to save Tazara from total collapse as the company had been experiencing major operational and financial problems with a debt burden of over US$100 million – Guardian. “Our banking system has maintained reasonable profitability”, he pointed out. He also announced that the Bank of Tanzania recently took steps to review the minimum capital requirements for commercial banks, raising it from Sh5 billion to Sh15 billion. This would consolidate the strength of the banking industry and enhance its ability to self-bailout in case of a crisis. On the proposed East African Monetary Union (EAMU), the PM said that recent reforms in Tanzania’s financial sector had placed the country in a better position for financial integration. Since these had been undertaken in various phases dating back to the early 1990s, the number of banks that operate in the country had increased to 42, up from only three public-owned banks in 1992. Insurance companies had increased from two in 1990s to 26 at present. The total assets of banks had risen significantly from an average of 6% of GDP in the early 1990s, to above 40% of GDP currently. The government has issued a warning to foreign traders doing small business in Tanzania without following procedures. One of the requirements for a foreigner to do business in the country is that he should have a minimal capital of $300,000. Some foreigners are said to be entering the country for work on the mines or on major projects but later moving into petty trading in Kariakoo market in Dar es Salaam. The Guardian has reported that there has been an increase of shopkeepers of Chinese origin at several business centres in the city which were adversely affecting local businesses. However former Industry, Trade and Marketing Minister Dr Mary Nagu she said this was due to globalisation. “It is not only Tanzanians who conduct their businesses in the area, but also Congolese, Zambians, and Malawians” she said. 100,000 hectares of land in Tanzania’s Rufiji valley are to be developed by South Korean corporation KRC as part of Tanzania’s Kilimo Kwanza programme. In an interview with the BBC, Lee Ki-Churl, of the state-run Korean Rural Community Corporation, said the move would see Tanzanian farmers benefit from an education centre as well as from South Korean expertise on the ground. Plans envisaged half the land given over to local farmers with the rest being used to set up a food processing complex for exports to Korea. The initiative was said to be partly the product of Prime Minister Mizengo Pinda’s visit to South Korea to help develop economic ties between the two nations. While some donors have decided to cut down on their donations towards General Budget Support, Britain is giving Shs 230 billion in the financial year 2010/11. This was said by the UK Parliamentary Under-secretary of State for International Development, Stephen O’Brien, during a visit to Tanzania. Earlier on, the British minister had a meeting with Finance Minister Mustafa Mkullo during which they had a profound discussion on the utilisation of the funding. “This will help in the priority areas as stipulated in the Mkukuta development strategy,” said the statement. Tanzania ranks third among the recipients of British aid – Mwananchi. 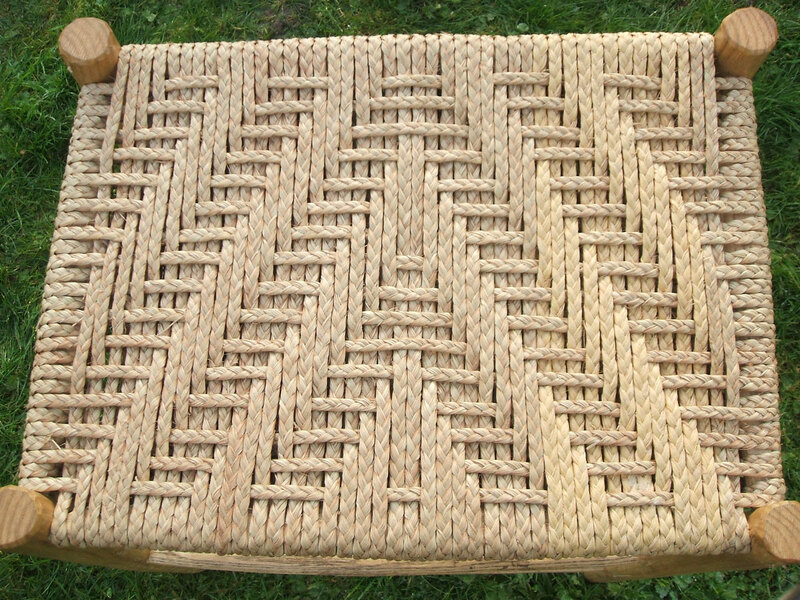 ‘Hopefully this trade in kamba will help the producers and give some of you a wonderful “new” material to work with.’ Thanks to Tim Brooke for recommending this item – Editor. Coin Shortage – “Retailers, buyers suffer as coins shortage bites hard” reads the headlines (The East African, August 2-8, 2010). Apparently, major retail chains in Kenya like Nakumatt, Tuskys and Uchumi now offer sweets to customers instead of coins. The acute shortage of coins has been blamed on runaway inflation, which has rendered lower denomination currencies almost worthless. Extract: ‘Tanzania has spent $4.027 million in expanding Ruaha National Park on the southern tourist circuit, making it the largest game sanctuary in Africa. The park has been annexed to Usangu Game Reserve, increasing its size to over 15,000 square kilometres. Tanzania National Parks Authority Director for Planning Projects and Tourism Services Allan Kijazi told The EastAfrican … that a large chunk of the cash was used to compensate local people who were displaced in order to pave the way for the project.’ Government officials expect the expanded park to boost tourism. In April 2010 the eruption of the Icelandic volcano Eyjafjallajökull resulted in an ash cloud causing widespread airline disruption and financial loss. However, despite such losses Africa’s well-established floriculture sector managed to absorb the impact and is moving ahead. Extract: ‘Tanzania’s intelligence personnel have intensified a manhunt for kidnappers after several children were rescued from a gang of criminals in Uganda. The kidnappers operating from Uganda’s capital Kampala have been abducting children under 10 years in Tanzania, triggering the worst panic among parents in the country’s history… The crime is a relatively new phenomenon in Tanzania and is forcing parents to reduce their working hours to stay at home with their children.’ Tanzanian parents are paying as much as $6,000 ransom for the safe return of their children. Immediately following the headline a statement reads: ‘Tanzania is still a backwater compared with its Kenyan neighbour to the north.’ However, CCM candidate January Makamba has plans that, if successful, may begin to change this view. Potent malaria drug offers hope of a single-dose cure – The Times (03.09.10). This article shows a picture of the singer Cheryl Cole who contracted malaria in Tanzania in 2010. Extract: ‘The first patient trials of a potent new anti-malaria drug could begin by the end of the year, after animal experiments showed it to be highly effective against a disease that causes more than 800,000 deaths a year. The new agent, known as NITD609, promises to provide a new generation of treatments for malaria, which could fight strains of the parasite that have developed resistance to today’s frontline drugs. Such fresh therapies are considered to be critical to the prospects of containing malaria, which causes 243 million infections worldwide and 863,000 deaths each year. The disease … kills a child in Africa every 45 seconds… Rick Davis, business development manager at the Wellcome Trust, said: “A single-dose cure would go a long way to addressing the unmet medical need in malaria …”’ Thank you John Sankey for this item – Editor. Extract: ‘Many professing Christians and Muslims in sub-Saharan Africa also believe in alternative gods, witchcraft, evil spirits, sacrifices to ancestors and reincarnation, according to an extensive new survey [conducted by the US-based Pew Research Center, which specialises in religious issues]… The survey found that Tanzania had the highest levels of belief in juju and superstitious objects… In contrast, Rwandans were found to be the least superstitious people in Africa, with only five out of 100 people interviewed saying they believed in juju.’ Thank you John Sankey for this item – Editor. The Economist (November 27, 2010) included an interesting Vodafone Innovation advertisement with the heading: Using simple tools to solve complex problems. The ad is based on a testimony by Mfaume Hermedi, a district health co-ordinator in Tanzania. Extract: ‘[Mr Mfaume] can now use SMS technology to help reduce the spread of malaria.’ The advert text points out that if the right drugs to treat the disease were more widely available, this would reduce the number of people dying from malaria. Extract continues: ‘Malaria outbreaks occur all over the country and it is difficult for health care professionals such as Mfaume to keep track of the stocks available in all the different clinics … [which is the reason] why Vodafone’s SMS for Life programme has made a huge difference. It’s a partnership between Vodafone, Novartis, IBM and Roll Back Malaria, and it’s a service that helps Mfaume keep account of his supplies. All he has to do is send a text message from the drug distribution centre where he is based to remind staff at the clinics to check and report on their stocks. Each reply feeds into a database covering the entire province so Mfaume can see a detailed report showing him where stock are running low. Mfaume can now allocate or even re-allocate his supplies to where the need is greatest.’ Thank you Ron Fennell for this item – Editor. Gemma Sisia, from a sheep farm in New South Wales, Australia, is one of the remarkable people who do extraordinary work in Tanzania. Gemma founded the School of St Jude in Arusha in 2002 with just three students and one teacher. The school now boasts over 1300 students and 350 staff. The Australian local community newspaper the Cambridge Post (November 20, 2010, Vol.37, No. 47) featured the sponsor Evi Ferrier of Mosman Park, Perth, who visited the school. Extract: Nine-year-old Samwel Wilson, a student at the School of St Jude … was over the moon when Evi Ferrier … dropped in for a visit and helped make costumes for the school musical, Joseph and the Amazing Technicolor Dreamcoat… With a motto of Fighting Poverty through Education, [the School of St Jude] educates some 1300 of the country’s poorest but brightest children and is helping them break the cycle of poverty that has gripped their families for generations. The education is free and sponsors like Evi cover the cost of fees, uniforms, stationery, transport, hot meals, snacks and drinks for each child. To read more about the school’s amazing success, or join its sponsorship program, see www.schoolofstjude.co.tz.’ Thank you Douglas Gledhill for this item – Editor.